Geir Pavla, a former SEAL, has recovered from the damage done when his squad's truck drove over an antitank landmine more than two years ago. Six other team-mates were also badly injured, the seventh--Mouse--dead, in what their team leader realized later had to be a trap. Geir has been trying to uncover details about Mouse’s history. The more he discovers, the more he fears their newest member was nothing of the man they thought they knew and believed they could trust. Morning Blossom runs a B&B in San Diego that her father co-owns. Unfortunately, he wants to sell despite that the business is the safety net she needs to pursue her passion for painting. While she longs to make a career of what's only ever been a hobby, she isn't sure she has the ability to be a success. Morning has avoided long-term relationships after one man who'd stayed at the B&B wanted to take up perpetual residence despite her objections. Geir, however, is someone she could grow used to having around permanently. I am committed to this entire series. Each addition takes you deeper and deeper into the mystery surrounding this SEAL team and the horrific bombing that forever changed their lives. The deeper we go, the more tidbits that are revealed leading to a spectacular revelation, I’m sure! Like Laszlo, Geir is one of the quiet ones. He moves with quiet intensity, is aware of his surroundings and all that are in it. I look forward to his interaction with Morning Blossom. She is as deep into this mission as much as the rest of the team, they all just don’t know it yet or how it all fits. This story is loaded with tiny twists and turns that detail the current events as well as the past events Geir and the team are looking for. They solve one little riddle only to uncover a larger one that has a larger clue or a bigger mystery. I love this! Integrated with the clues uncovered is Morning’s underdeveloped passion for her art. She is a complex, deep, passionate woman and Geir is tuned right into her. I remain hooked on this series with Geir and Jager quietly investigating some of the most heinous habits of one man but yet this one man is just a small part in this story. The clues uncovered are leading us on a merry chase that is all about finding the mastermind that has nearly destroyed each and every remaining member of this team. I couldn’t put it down and read this story all in one sitting. Each member of the team seems like family and I have to know what happens! Excellent job! I loved it! Amazing book. This book features Morning Blossom, and Geir. This story is edgier and darker than the previous books in the series, and oh my gosh.. it was gripping. I could not put this book down. 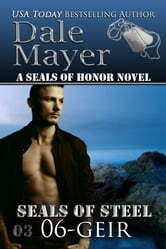 From start to finish you will be wondering what Geir and Jager will find out about Mouse and his past. Then you have Morning, who is running a quiet B&B, and now that Geir and Jager are around, it’s not as quiet . The men are getting so much closer to finding out what happened in their accident. Fantastic storyline, and I can’t wait to see what happens in the next book featuring Jager. I received a free copy of this book via Booksprout and am voluntarily leaving a review. I love the Seals of Steel series and loved Geri's story. Lots of suspense in this book that kept it interesting. Looking forward to Jager's Book and finding out the mystery of who did it. A fantastic addition to the series. Wow. As we hit book 6 in the journey of 7 seals trying to find out who their opponent is who injured them all and killed a team mate with a road side bomb. Geir has gone to Coronado and a local B&B to track down leads with Jäger. As they meet Morning Blossom and start their investigations, unexplained things start to happen at her B&B. When the chips are down and all three of their lives are in danger from “poppy” can they all survive. Wow. I know I was waiting for this book but OMG I want Jager’s book now. I can’t wait for book 7. There are so many questions that need answering.